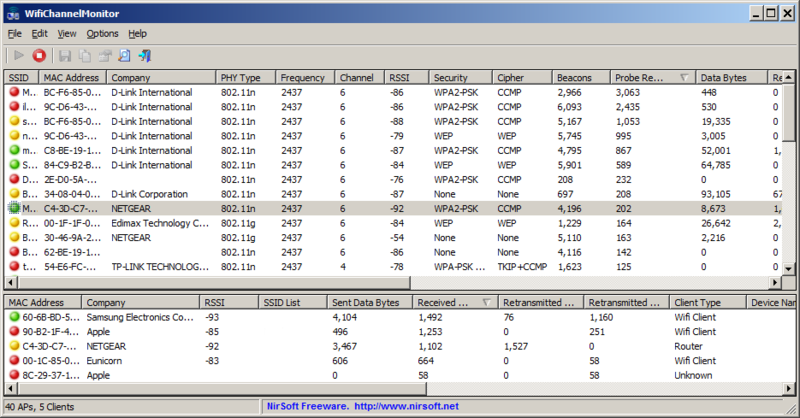 WifiChannelMonitor is a new tool for Windows Vista/7/8/2012 that captures wifi traffic on the channel you choose, using Microsoft Network Monitor capture driver in monitor mode, and displays extensive information about access points and the wifi clients connected to them. WifiChannelMonitor also allows you to view the information about wifi clients that are not connected to any access points, including the list of SSIDs (network names) that they are trying to connect. You can get more information about this tool in the official page of WifiChannelMonitor. Posted by NirSoft on June 1, 2014 at 2:13 pm under Utilities Update.